Proudly Serving Newnan Ga and surrounding areas with honest and reliable automobile repairs since 2013. Serving Newnan, GA and surrounding towns. 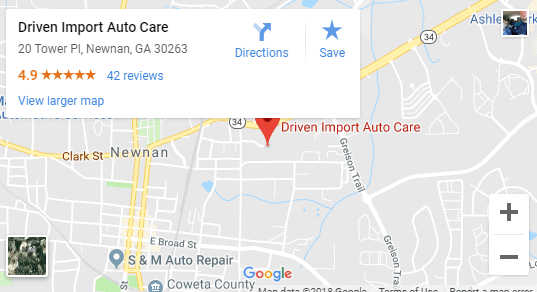 Driven Import Auto Care has been a mainstay here in Newnan, GA for years. We take pride in knowing we are serving not just a customer but our neighbors. Our team of factory-trained mechanics can diagnose your complete auto care needs, from automotive repairs to simple bodywork. We offer the dealership experience at a fraction of the price. Driven Import is grateful that our customers repeatably use us for all of their auto repair and service needs. Each expert mechanic on our team understands that the very thought of getting an automobile repaired can make most people nervous. We are very mindful of your time and we are very thankful that you chose us for your repair. We look forward to servicing your vehicle in the future. I had my ‘94 Integra in here not too long ago. Dustin, Brandon and their team did a phenomenal job on getting it fixed for me. Within a matter of 3 days or so they ran fresh exhaust with new headers, lifted the vehicle from it being lowered, pulled a huge dent if that’s what you want to call it out of the bottom core of the front end. Once again thanks guys I appreciate all of y’all a hard work and dedication to such an older vehicle! Brandon and the guys at Driven have always been honest, reliable and priced lower than the dealerships! I would definitely recommend their service. The guys at driven are the only ones I trust with my BMW 335I. They are polite professional and prompt. They provide the same service at a fraction of the price than the dealer.i have been taking my vehicles to them for years.. highly recommended! Driven Auto Care recommends only what is needed and doesn’t try to add on services that aren’t necessary. They treat your car as if it is their own to keep it maintained. The estimates are accurate and time required is right on, too. The quality of the work done has been excellent. The business is near the big water tower in Newnan, right off Bullsboro Dr. 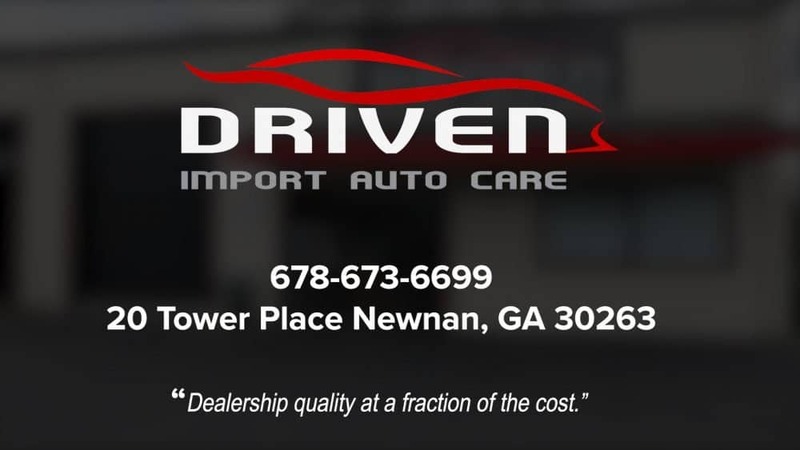 Here at Driven Import, we offer full-service auto repair and specialize in: BMW, Honda, Toyota, Acura, Lexus, Nissan, Infiniti, Mercedes-Benz, Porsche, Volkswagon and Audi. If you are coming from the Coweta County Courthouse you will turn right on Jefferson St and continue for 1.5 miles. You will take Farmers St. to the right. The next road to your left will be Tower PL, we are on the bend. Look forward to seeing you. If you are coming from the Chattahoochee Bend State Park you will take Bud Davis Rd to Mount Carmel Rd. Continue on Mount Carmel Rd. Take Welcome Rd o Farmer St in Newnan. Drive to Tower pl and we are on the corner. Auto Repair done right the first time.